Happy Easter! The farm and garden have started to come to life as we pass the mid-point of April. We thought it would be a great time to get the camera out for some early Spring photos. 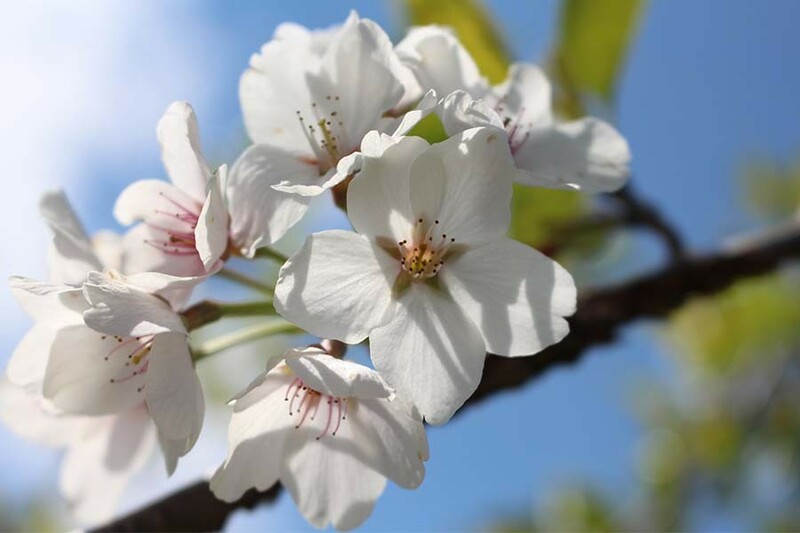 Early Spring Photos – The apple blossoms are out! A lot has changed since last Spring at the farm. For starters, we live here now! It has been so incredibly wonderful to wake up here each and every day and enjoy the change that Spring brings to the farm. The daylillies are charging through the crust of the soil in their bright mint green color. Fields are filled with hundreds of dandelion blooms waiting for bees to find their showy flowers. Ornamental grasses are beginning to come to life as the reddish-green shoots plow through the pale-brown flat top haircuts we gave them a few weeks back. And of course, the gorgeous first blooms of the fruit trees, grape vines and more are starting to appear. It all makes for some beautiful early spring farm photos, so we hope you enjoy them all below! Happy Easter and Happy Spring! – Jim & Mary. If you would like to receive our DIY, Gardening and Recipe articles each week, you can sign up to follow the blog via email in the right hand column above, “Like” us on Facebook, or follow us on Twitter. This article may contain affiliate links. 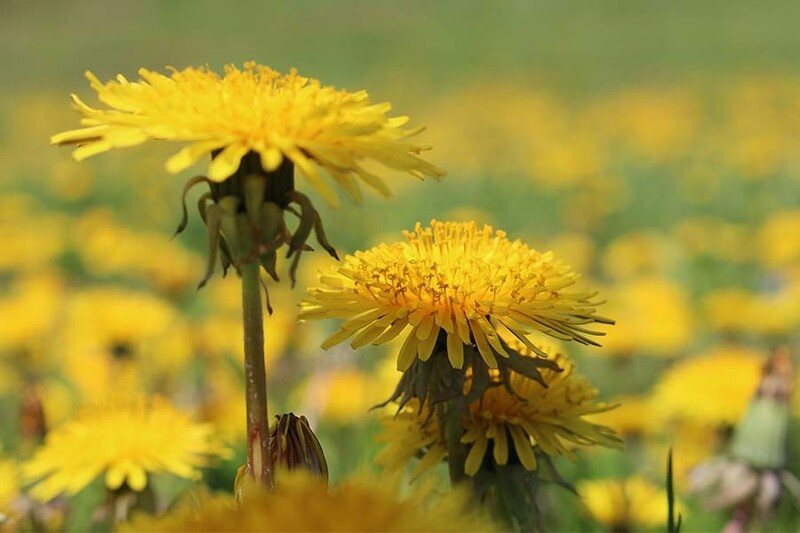 Dandelions In The Field – The grass and fields around are filled with the beautiful dandelion blooms – one of the best early food sources for the honeybees! 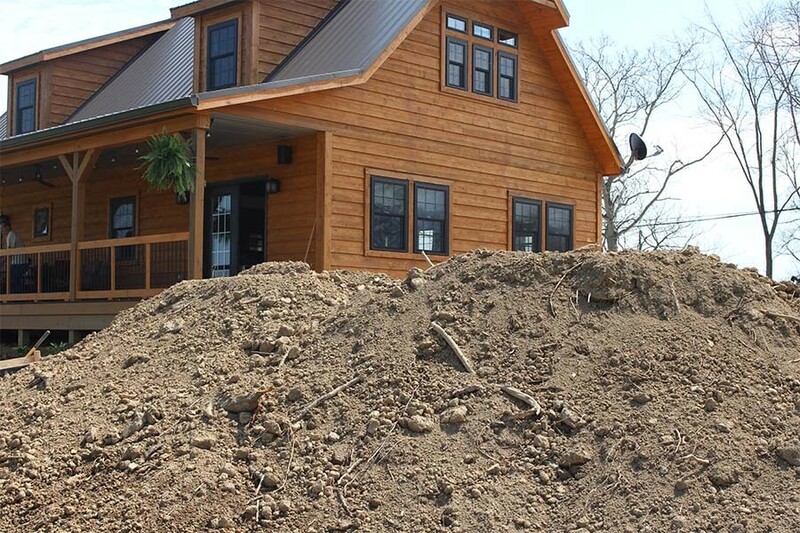 With the house in the background, the dirt pile is in place for the next project, the outdoor pavilion. More on that in the coming weeks! The seedlings await! 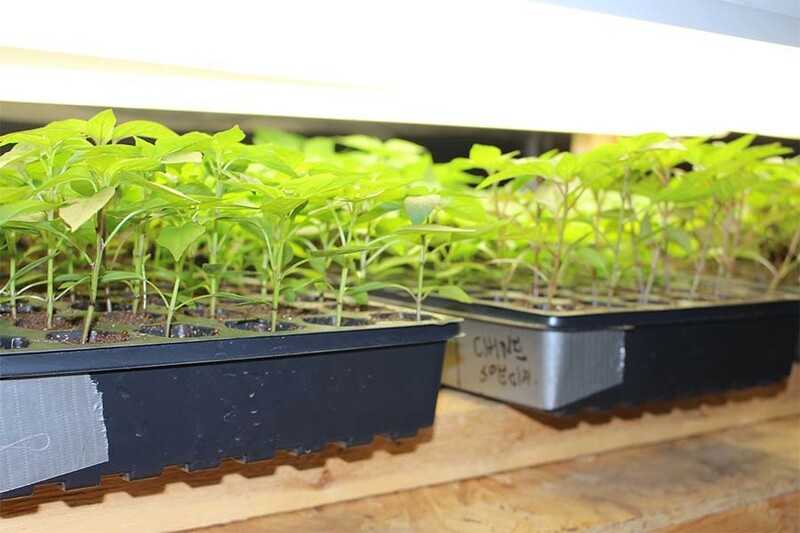 Our ornamental pepper and vegetable seedlings are looking great indoors – waiting for their chance soon to go into the garden! The Apple Blossoms. 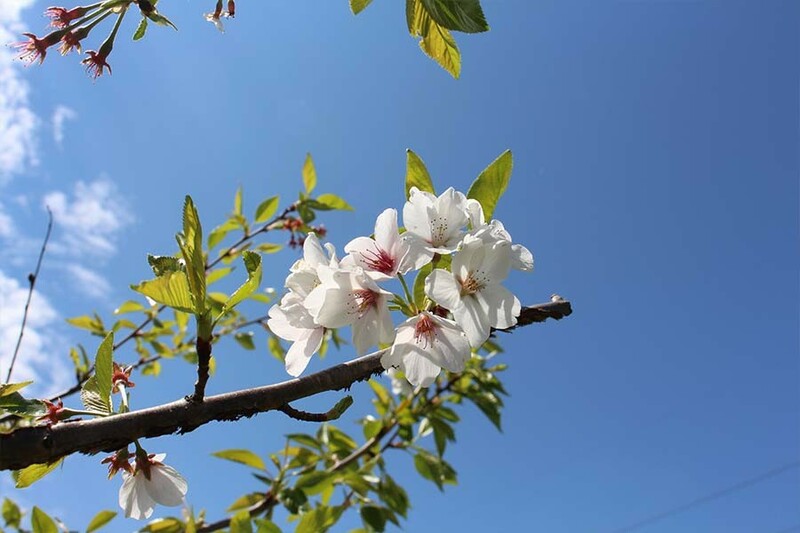 The fruit trees are all beginning to show signs of life with their showy blossoms. Our fruit trees should begin to produce well now that they are heading into their 4th year. We can’t wait! 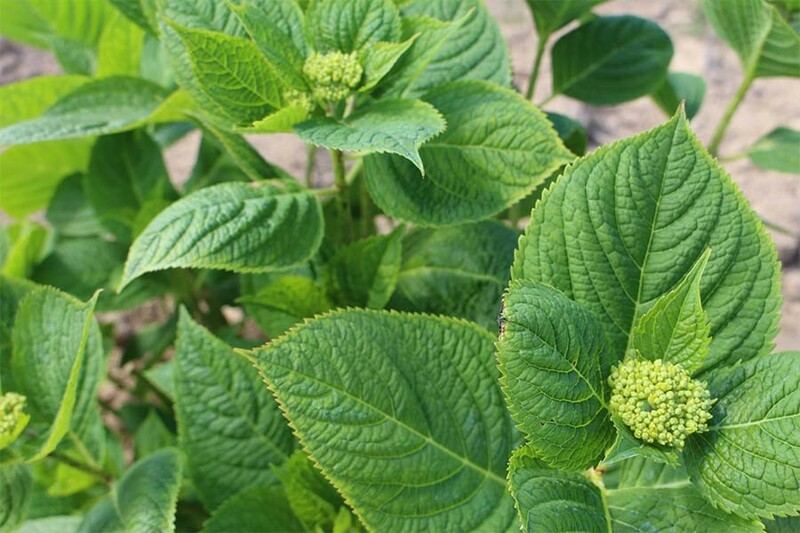 The newly planted Hydrangea on the east side of the house is all set to bloom. We created a new flowerbed off of the east side of the porch to add a little color. The morning sun that blankets the area should be a perfect place for the Hydrangea to thrive. 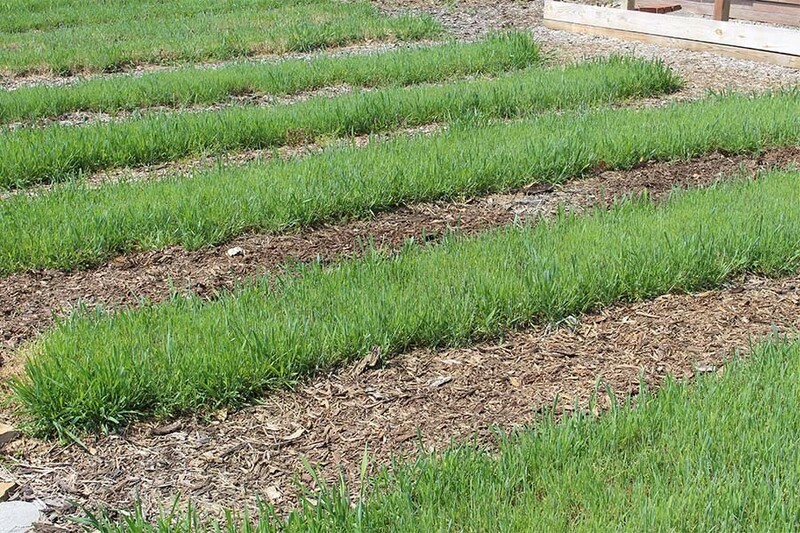 Cover Crops In The Garden – The annual rye has greened-up and keeping back any invading weeds in our raised row garden rows. We do not till this in anymore, opting instead to mow and bag it each week and put the remnants in the compost pile. It dies back and we plant right through it with our tomatoes, peppers and more. Jazzy In The Garden. 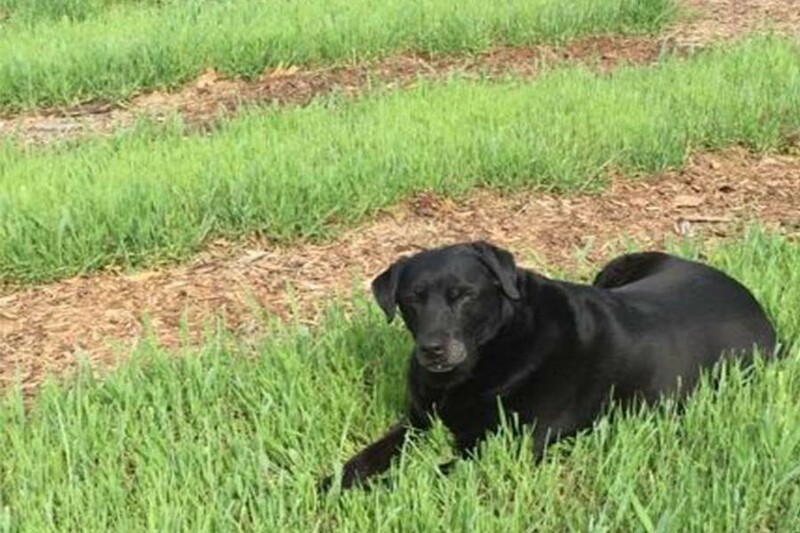 One other great use for our cover crops – a great resting place for our 10 1/2 year old lab Jazzy. The Water Tanks. As we have from the beginning when we had no running water at the farm, we water with captured rain. 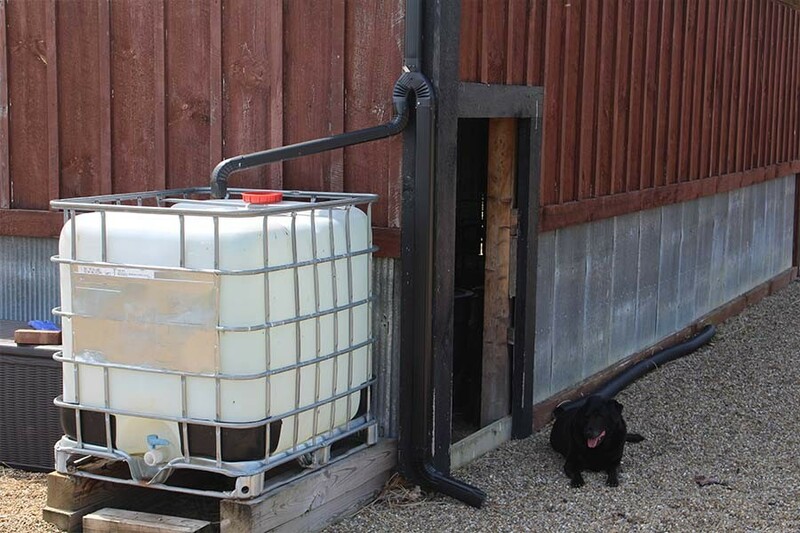 We hooked our tanks up last week, and after a big spring rain, this one is already full with 275 gallons! And yes, another place for Jazzy to rest! The New Chicks meet The Old Hens. The new chicks have been put into the “big girl coop”, and the old hen can’t quite make out what has happened! All in all, they are all doing very well in their first week together. 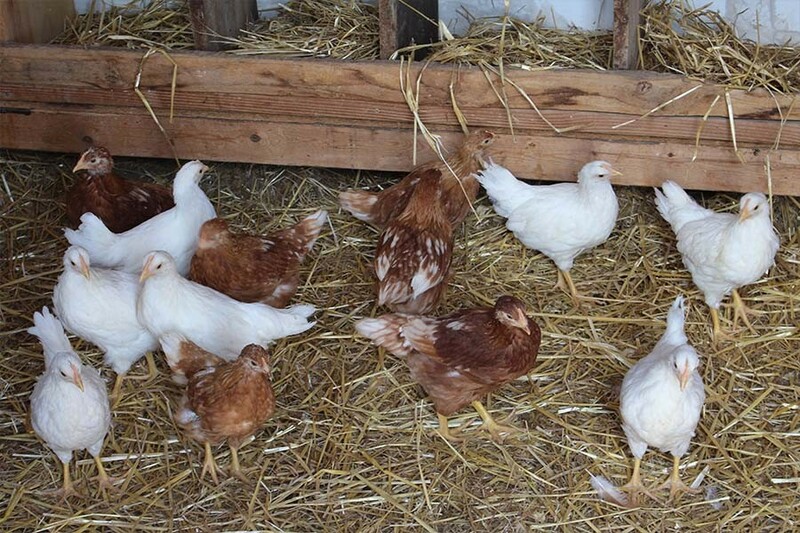 Another photo of the chicks inside “The Big Coop”, enjoying the new space. So exciting! Thank you for sharing your wonderful projects with us. Looking forward to seeing what you’re in store for next! Happy spring! Everything looks great– including Jazzy!! Gotta love labs! Luv your photos and Springtime Magic! 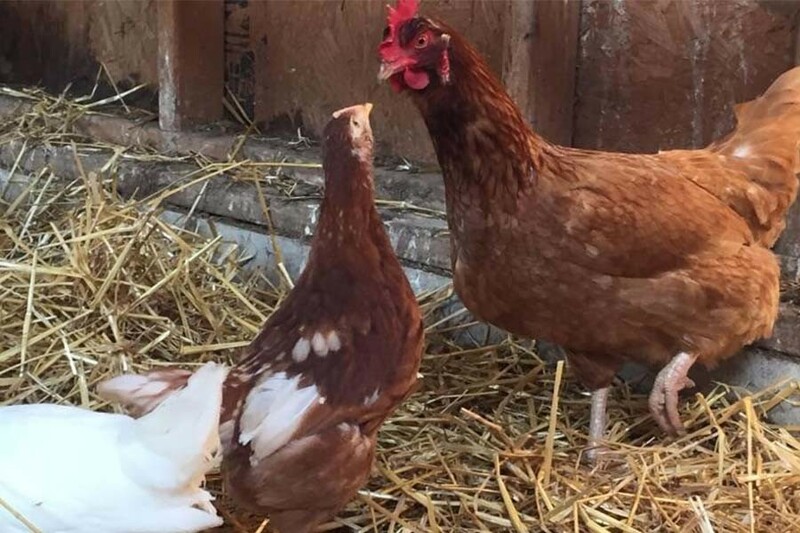 How old are your new chicks when you put them in with the other hens? Was this a difficult process? Thank you for your postings. We have started a raised bed garden like yours as a retirement project and the photos are a great help! Happy Easter! I’m so happy for you that you can experience this year’s Easter in your new dream home at the farm! what a wonderful place you’ve created! Isn’t Spring wonderful? I can feel your excitement. Happy Easter to you, Mary and Jim.